Learn more today about PunctureX performance data and learn how it can meet your application's needs. PunctureX meets ASTM Standards 2412 & 2413 for both Puncture Resistance & Flexibility. 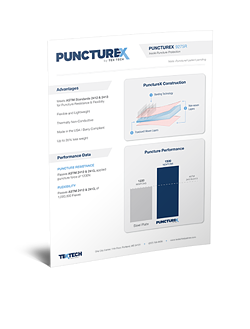 For your reference, we have provided a downloadable copy of our PunctureX Performance Data Sheet, which you can access by filling out the form on this page.